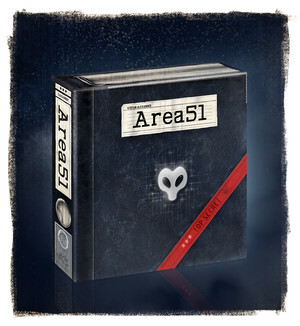 Area 51 is a strategic board game for 2-6 players about storing secret alien artifacts. Welcome to the 1950’s USA - the era of big cars, rock ‘n roll, and rampant alien activity! To prevent mass panic, the US military has ordered its top generals (you and your fellow players) to collect all evidence of aliens and store it in Area 51, a secret military base in the remote Nevada desert. You’ll need to build specialized bunkers for the advanced tools, futuristic weapons, biological samples, and alien clothing. Each bunker can only hold a certain type of artifact, and they will need to be upgraded if you want to hold the most advanced and dangerous artifacts. You can also hire trucks or trains that allow artifacts to be re-routed to different regions and different bunkers. At the end of the game, the player whose bunkers have loaded the most valuable artifacts will be the winner.